Reflections are a classic photography technique, and the results can be breathtaking. 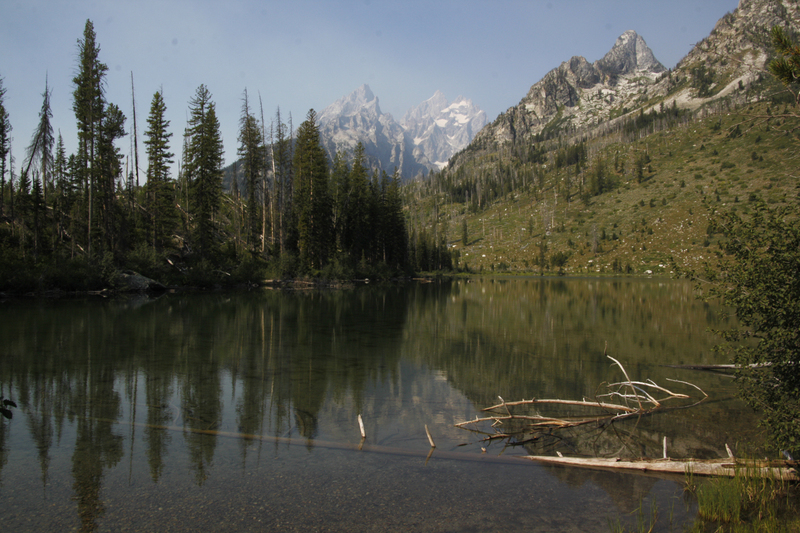 But you don’t need to get up at dawn to find a large, windless, still lake. 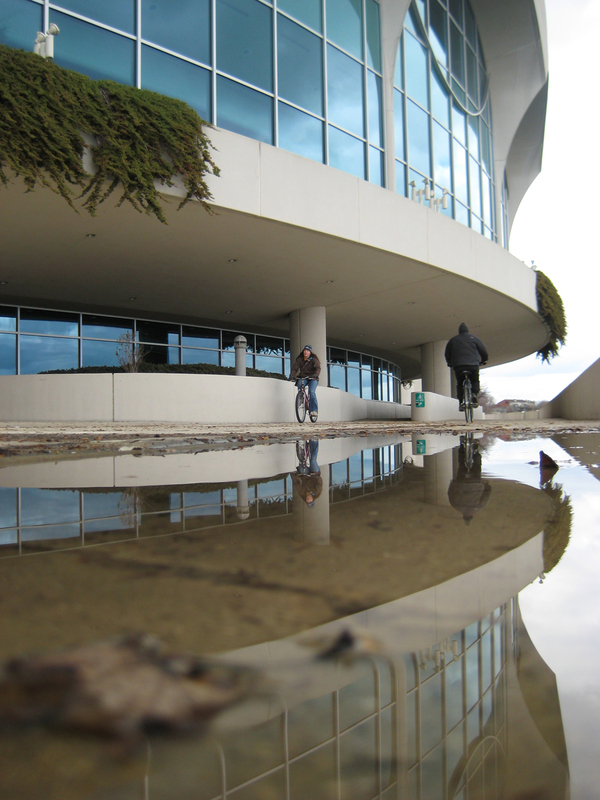 You can capture stunning reflections using nothing more than your point-and-shoot camera and … a puddle. Puddle photography works better with a point-and-shoot camera rather than a bulky DSLR for two reasons: one, the key to perfect puddle photography is to put your camera down as close to the water as possible and two, having a large viewscreen makes it much easier to compose and level your image. The first order of business for puddle reflections is to find a suitable puddle in an interesting location. The puddle doesn’t need to be more than a foot or two long and a foot wide, but a wider puddle will give you more composition options. It is also helpful if the puddle is relatively level with whatever you are looking to reflect, rather than bounded by something concrete like a wall or curb. 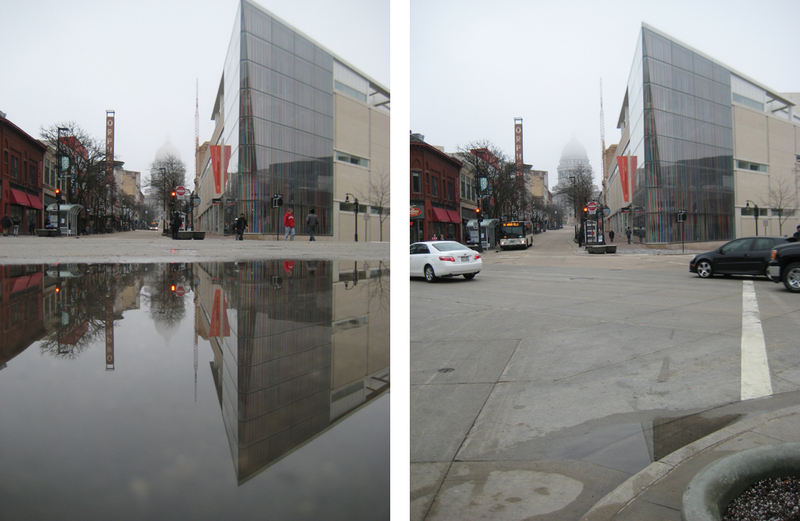 ‘Natural’ puddles will give you a more seamless transition in-and-out of the reflection. This gives the more ‘infinity pool’ style effect that really makes these images. Once you’ve found your puddle, you want to position your camera as close to the surface of the water as possible. I’ve found it’s often helpful to put your finger underneath to help judge where the water level starts. For focusing, I usually point the camera down a little bit to focus on the far end of the puddle, hold the shutter down half-way to lock focus, recompose to level the composition and take the picture. If you want to squat down to where you can see the viewscreen, mores the better, but you can also simply lean over, take the picture, and then check your results. The following diptyches of images demonstrate just how easy this technique can be and offer a realistic look at the puddles involved. Two views of the same puddle. The first, taken down low to emphasize the puddle, and the second taken to show the relative size and location of the puddle. 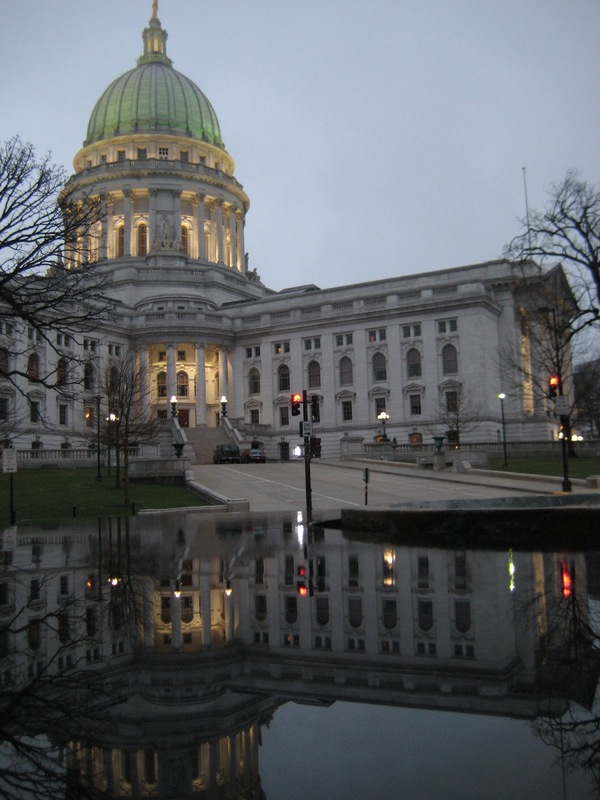 This reflection of downtown Madison was taken using the gutter puddle pictured on the right. 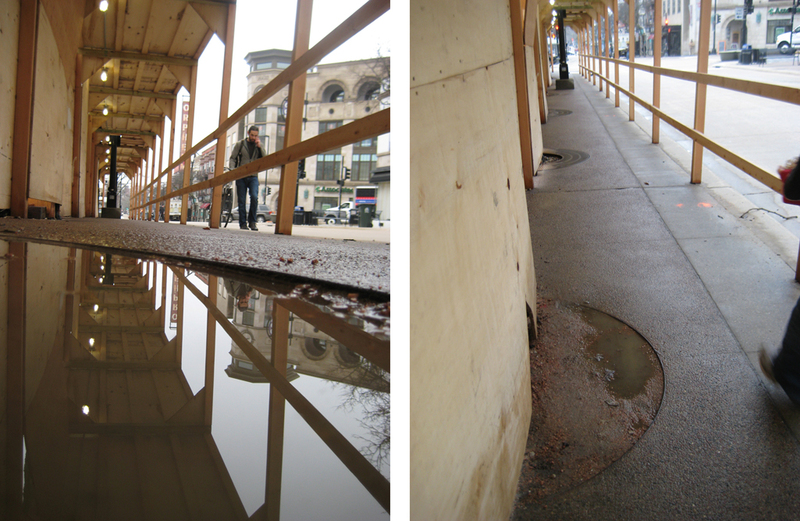 This reflection within a temporary scaffold was taken from the tiny puddle on the right. You are not just limited to puddles. Roadways and paving stones can often be reflective when wet, even without a formal puddle. A slick of rain on stone pillars can also make a reflective surface. The photograph below was taken using water on top of a stone plinth across the street from the Capitol building. 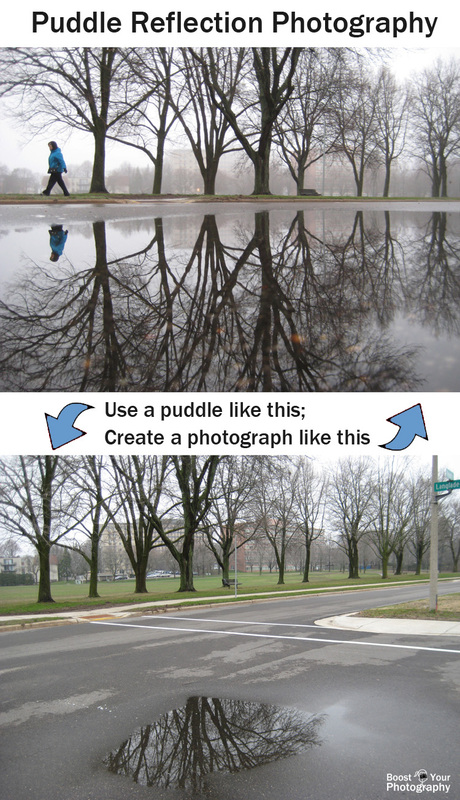 Puddles are a simple and easy way to achieve fantastic reflection shots. 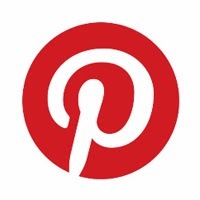 Feel free to share a link to your own puddle reflections in the comments.